The University of Houston’s Ed Oliver grew up wanting to be first. So far, so good. He wasn’t the first born in his family, having to settle for being the third of four boys, but he couldn’t help that. He wanted to be the first one remembered among the string of outstanding defensive linemen to come out of Westfield High School in Houston. Check. He wanted to be the first five-star recruit to play at the University of Houston. Check. He wanted to become the first sophomore to win the Outland Trophy. Check. Ed Oliver’s value system is different from most. Good is never good enough. The best can still be better. That is why he wants to be the best interior lineman in college football once again this fall. If he claims the 2018 Outland Trophy presented by the National Foundation for Infectious Diseases, Oliver will be only the second player to receive the award twice. Nebraska center Dave Rimington achieved the first double Outland Trophy haul in 1981 and 1982. “I do things differently,” he said. “I have a different mindset. Sometimes I get down on myself. I just want to work out and get better. The more people tell me I’m good, the more I come down on myself. Nobody could be harder on myself than me. 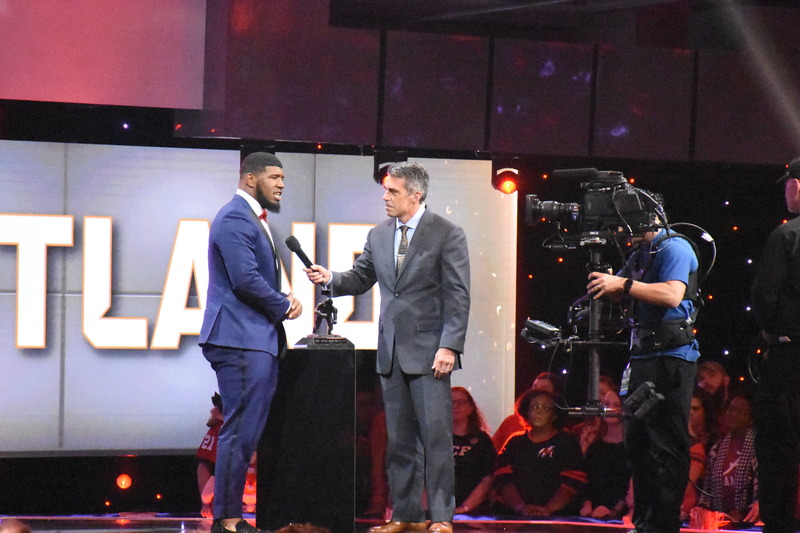 Ed Oliver of the University of Houston is interviewed by ESPN’s Chris Fowler after receiving the 2017 Outland Trophy at the College Football Awards Show. Photo by Andy Crawford. Oliver began receiving extra attention from opposing offensive lines when he started on the varsity as a sophomore in high school. Double teams became a way of life. He continued to prove himself worthy of the extra attention right away as a freshman in college. Oliver started the opening game of the 2016 season against No. 3 Oklahoma, made seven tackles, including two sacks, and helped the Cougars spring a 33-23 upset. There was no need to redshirt Oliver. He began dominating from day one. The double teams returned early in the season. They didn’t bother Oliver, or stop him. Westfield played a 4-3 defense and the offense focused on Oliver no matter where he lined up. By his senior year he was ranked the No. 2 defensive tackle in the country and the No. 2 player in the state of Texas. The double teams followed him to college. “The bodies just get bigger,” he said. “They’ll probably one-on-one block me in the NFL, because they’re professionals, mano-on-mano,” Oliver said with a smile. The prospect excited him. Oliver’s exploits in high school received national attention. But he didn’t get carried away with all the attention in recruiting. He took only two official visits, to Houston and Oklahoma. Naturally, Texas A&M and Texas wanted him. Baylor, too. So did Alabama and Notre Dame. And LSU and Mississippi. Oklahoma was the first college to offer Oliver a scholarship. Jerry Montgomery, the Sooners’ defensive line coach who went on to join the Green Bay Packers staff, saw Oliver in the spring of Oliver’s freshman year, before he had played a game of varsity football. Oliver knew little of the Oklahoma tradition. Or Houston’s. He didn’t pay attention to college football. He liked to play football, not watch it on television. Blum first spotted Oliver as a seventh grader, running around the gym, hanging on the basketball rim. Oliver played a little basketball and baseball outside of school, but football was always his game. His father, Ed Sr., who went on to be a construction worker, had played running back at Northwestern State, a I-AA (now FCS) school in Natchitoches, La. His older brother Marcus also played football and Ed just followed along. Houston held a relative edge in recruiting Ed Oliver. Marcus was already at UH. Marcus played in every game on the offensive line as a true freshman and started seven games at offensive tackle as a sophomore. “You can be a big guy here,” Marcus told Ed. Marcus was not the same caliber player as his younger brother coming out of Westfield. When Houston offered him a scholarship, it was a big deal. Two years later it made Ed’s decision easy. Ed and Marcus roomed together for one year in college. But Ed didn’t like the idea of going one-on-one against his older brother in practice. They had faced each other only once in practice in high school. Marcus moved to guard for his junior year at Houston, which could have lined him up against Ed in practice. Tom Herman, the offensive coordinator of Ohio State’s 2014 national champions, parlayed that into becoming coach at Houston for the 2015 season. He led the Cougars to a 13-1 record in his first season, even without Ed Oliver, climaxed by beating Florida State 38-24 in the Peach Bowl. Herman continued his success in the offseason by signing Oliver. Houston had built its football reputation by recruiting players that Texas, A&M and other Big 12 schools didn’t want. Texas tried to recruit quarterback Andre Ware, who won the 1989 Heisman Trophy at Houston, as a defensive back. Getting Ed Oliver was a big deal. After a 9-4 record in Oliver’s freshman year, Herman bolted for Texas. Oliver felt a little betrayed. But the offer was too good for Herman to turn down. Houston didn’t hire A.J. Blum in an attempt to sign Ed Oliver. Blum joined Major Applewhite, Herman’s successor, a year after Ed Oliver arrived. The two had built chemistry during their days at Westfield. Playing for Blum as a sophomore, Oliver only got better. He made 69 tackles in 2017, including 14 ½ sacks, earning defensive player of the year honors in the American Athletic Conference, chosen by the league coaches. Winning the Outland was next in line. Oklahoma junior offensive tackle Orlando Brown and Notre Dame senior guard Quenton Nelson were other finalists for the award. At 6-2 and 290 pounds, he is not exceptionally large by today’s defensive line standards. What separates him? Oliver knew he might be special when people mistook him for a senior his freshman year of high school. Wearing a beard his sophomore year in college and with a baritone voice, he could easily pass for 25. His easy going personality belies the intensity he displays on the field. “He’s a goofball,” said Blum, who gives no special treatment to his best player in practice. Oliver requested to wear No. 94 at Westfield. But the coaches had something else in mind. They knew Oliver was special. They unretired No. 11 and presented it to Oliver. A former linebacker named Herman Mitchell had worn No. 11 at Westfield. His junior year Mitchell helped Westfield to a 13-1 record and the regional semifinals. He committed to Oklahoma before his senior season. Then, Aug. 23, 2007, the day of a scrimmage, Mitchell was shot and killed at an apartment complex by a one-time friend. Ed Oliver learned the legend of Herman Mitchell. Wearing No. 11 proved ideal for Oliver because he occasionally lined up as a fullback in Westfield’s goal line offense. He enjoyed that. No need to change jerseys for offense. The Ed Oliver bobble-head created by UH to promote his candidacy for 2018 awards. Wearing No. 10 at Houston made sense. But he didn’t carry the ball until the final game of his sophomore year. Oliver scored the first touchdown in Houston’s bowl game, a one-yard plunge in a 33-27 loss to Fresno State in the Hawaii Bowl. Ed Oliver is kind of a Cougar cowboy. He loves to ride, go-karts, motorcycles, horses. He has three horses on his Dad’s farm in Marksville, La. Before the 2018 season, Houston created a bobble-head as a promotion for Oliver. This one is rather unique: Ed is riding a horse named Oreo, who in real life was maybe the most stubborn horse that Ed had ever ridden since he was 8 years old. Oliver credits riding Oreo for one of the reasons he is the player he is today. Oliver has promised not to go through the motions his junior year at Houston, even with the NFL awaiting. He played through five games in 2017 with a nagging knee injury, but still impressed enough to claim the Outland Trophy. “There’s a lot to be accomplished, so you’ve got to watch me,” he said, speaking more like a guy trying to sell tickets than inflate his ego. “I want to do everything I did, and be healthy the whole year. I want to show people what they missed last year if I hadn’t gotten hurt. They saw a glimpse of Ed Oliver, a sneak peek. I could go forward pretty fast, but couldn’t move side-to-side. That’s what took away from my game. The Cougars will miss him more. CHARLOTTE, N.C. — The Charlotte Touchdown Club is excited to announce a new partnership with Rolle Oral & Facial Surgery to present the Bronko Nagurski Legends Award. In conjunction with the Football Writers Association of America, the Charlotte Touchdown Club presents the award each December at the annual Bronko Nagurski Awards Banquet to an outstanding collegiate defensive football player from the past 40 years. This year’s legends award recipient is Ohio State linebacker Tom Cousineau from the class of 1977. Past legends award winners include: 2007-Alan Page & Bubba Smith, 2008-Ted Hendricks, 2009-Roger Wehrli, 2010-Mike McCoy, 2011-Jack Youngblood, 2012-Larry Jacobson, 2013-Randy Rhino, 2014-Randy White, 2015-Randy Gradishar, 2016-Chet Moeller, and 2017-Ross Browner. This year’s Bronko Nagurski Awards Banquet will be held Monday, December 3rd at the Charlotte Convention Center. University of Michigan head coach, Jim Harbaugh, is slated as the keynote speaker. The Charlotte Touchdown Club is a 501(c)3 non-profit organization founded in 1990 for the purpose of promoting high school, collegiate, and professional football in the Charlotte, North Carolina region. Since its inception, the club has grown as well as diversified boasting a sponsor team of more than (80) companies. The Club’s activities and services focus community attention on the outstanding Citizenship, Scholarship, Sportsmanship, and Leadership of area athletes and coaches. Through individual and corporate support, more than $2,000,000 has been raised to benefit the Touchdown Club’s scholarship efforts. For more information, contact John Rocco (704-347-2918 or jrocco@touchdownclub.com). The official website of the Charlotte Touchdown Club is www.touchdownclub.com. Founded in 1941, the Football Writers Association of America consists of the men and women across North America who cover college football for a living. 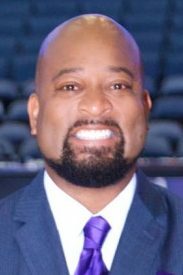 The membership includes journalists, broadcasters and publicists, as well as key executives in all the areas that involve the game. The FWAA works to govern areas that include game day operations, major awards and an All-America team. Through its website, the FWAA works to improve communication among all those who work within the game. The FWAA also sponsors scholarships for aspiring writers and an annual writing contest. Behind the leadership of President Stefanie Loh and Executive Director Steve Richardson and a board of veteran journalists, the FWAA continues grow and work to help college football prosper at all levels. There are now over 1,000 members.